At Jose Ortega Elementary, we focus on teaching science through hands-on science experimentation rather than learning science from a textbook. 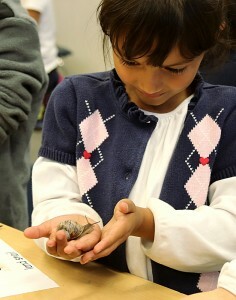 All students at JOES have one hands-on science experiment each week. This creates engaged, excited science students! Students are often heard plaintively asking, “Do we have science today?” After all, who wouldn't love studying live crayfish to understand how their behavior is related to survival, for instance? While these experiments are clearly a more enjoyable way to learn science, hands-on experiments take time – time to prepare and time to clean up. To aid our already busy teachers, we have two science consultants at our school. Our PTA funds both, one science consultant (B.A. Biology) to work with preK-3rd grade classrooms, and the other science consultant (Ph.D. Biochemistry) to work with 4th and 5th grade classrooms. Our science consultants prepare experimental materials, decrease the student : teacher ratio during the experiment, and whisk it all away at the end, so students can immediately switch to their next academic topic. We have even set up a science classroom in a bungalow to further facilitate our program. It serves as a staging area for us to prepare experiments, store our equipment, and maintain our living organisms when they aren’t in the classrooms. Of course, our program depends on our dedicated and talented set of teachers who continue to push our program forward. Four of our upper grade teachers are part of the 3-year California Academy of Science Teacher Institute on Science and Sustainability (TISS) program for science professional development. This program strengthens science teaching by encouraging teachers to focus more on the scientific method, science reasoning, and scientific argumentation, rather than on just learning science facts. Our TISS-trained teachers are bringing new methods to the classrooms and a new emphasis on independent experimentation. We are asking students to explain the world around them based on what they are learning in class. For instance, in 4th grade, students were each assigned a different landform (for example, a beach) and asked to explain how it formed based on everything we had learned about earth processes. Poster by 4th grade students. Groups of two students were asked to make a poster explaining how a beach forms. They were told to incorporate the words weathering, erosion, and deposition. We have seen remarkable progress in all our students’ ability to reason, hypothesize, and argue from evidence. We have happy budding scientists and excited teachers. And all of this anecdotal evidence is backed up by a rise in our science test scores on the California Science Standards Test (CST) given to 5th grade students.